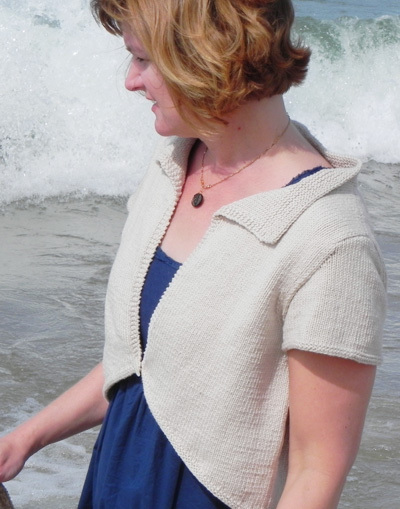 Adeline is a loose-fitting bolero designed to be worn over summer dresses and cap-sleeved T-shirts. The style is versatile but not body conscious; easy but not matronly. 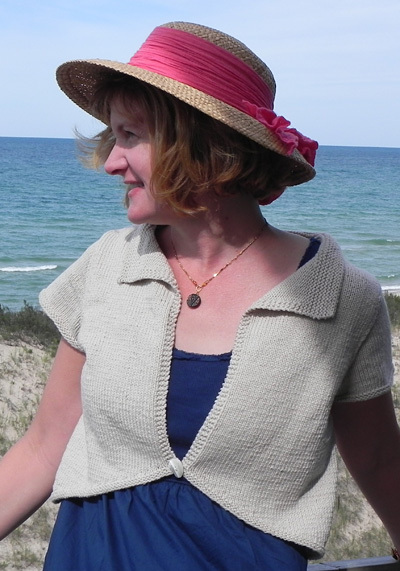 It is the answer to my wish to design and own a summer cover-up that looks good on many body types and ages, for many occasions. Adeline is worked flat in pieces. 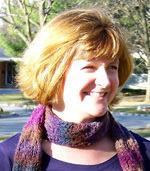 The garter stitch edging is knit as you go, except for the collar, which is picked up and knit after the pieces are assembled. Short rows create the slanted cut in front. Note: Color shown has been discontinued. CO 82[92, 102, 112, 122, 132, 142] sts. Beginning with a RS row, work in stockinette st until work measures 9.5[9.5, 9.5, 10, 10, 11, 11] inches, ending with a WS row. BO 7[7, 8, 9, 10, 11, 12] sts at beginning of next 2 rows. 68[78, 86, 94, 102, 110, 118] sts. Decrease Row [RS]: K2, ssk, k to last 4 sts, k2tog, k2. Repeat these 2 rows 5[5, 7, 9, 10, 12, 13] times more. 56[66, 70, 74, 80, 84, 90] sts. Continue in pattern until work measures 17.5[18, 18, 19, 19, 20, 21] inches (8[8.5, 8.5, 9, 9, 9, 10] inches from beginning of armhole shaping), ending with a WS row. Row 1 [RS]: K to last 5[5, 6, 6, 7, 7, 8] sts, W&T. Row 2 [WS]: Sl 1, p to last 5[5, 6, 6, 7, 7, 8] sts, W&T. Rows 3-4: Sl 1, work to last 10[10, 12, 12, 13, 13, 14] sts, W&T. Row 5 [RS]: Sl 1, k to end, picking up wraps and working them together with wrapped sts. Row 6 [WS]: P all sts, picking up wraps and working them together with wrapped sts. Row 7 [RS]: K13[15, 16, 18, 20, 22, 24], BO next 30[36, 38, 38, 40, 40, 42] sts, k to end. Two sets of 13[15, 16, 18, 20, 22, 24] sts remain – place all sts on st holders. CO 44[49, 54, 59, 64, 69, 74] sts. Row 1 [RS]: K2, W&T. Row 2 [WS]: Sl 1, p1. Row 3 [RS]: K to wrapped st, pick up wrap and k it together with wrapped st, k2, W&T. Row 4 [WS]: Sl 1, p to end. Repeat Rows 3-4 until 2[4, 3, 2, 4, 3, 2] sts remain unworked after last wrapped st. K 1 row, picking up remaining wrap and knitting it together with wrapped st.
Next Row [WS]: K3, p to end. These 2 rows set pattern: left front is worked in stockinette st, with 3 sts at front edge worked in garter st as set. Continue in pattern until work measures same as back to underarm when measured along side edge (right edge when RS of piece is facing), ending with a WS row. Next Row [RS]: BO 7[7, 8, 9, 10, 11, 12] sts, k to end. 37[42, 46, 50, 54, 58, 62] sts. Decrease Row [WS]: K3, p to last 4 sts, ssp, p2. Repeat these 2 rows 5[5, 7, 9, 10, 12, 13] times more. 31[36, 38, 40, 43, 45, 48] sts. Contine in pattern until work measures 6.5[7, 7, 7, 7, 7, 7.5] inches from beginning of armhole shaping, ending with a WS row. Row 1 [RS]: K15[18, 20, 21, 24, 26, 28], ssk, k1. Place last 13[15, 15, 16, 16, 17, 17] sts of row on st holder; 17[20, 22, 23, 26, 28, 30] sts remain. Row 3 [RS]: K to last 3 sts, ssk, k1. Repeat Rows 2-3 3[4, 5, 4, 5, 5, 5] times more. 13[15, 16, 18, 20, 22, 24] sts. Continue in stockinette st until work measures 8[8.5, 8.5, 9, 9, 9, 10] inches from beginning of armhole shaping, ending with a RS row. Row 1 [WS]: P8[10, 10, 12, 13, 15, 16], W&T. Row 2 [RS]: Sl 1 , k to end. Row 3 [WS]: P3[5, 4, 6, 7, 9, 10], W&T. Row 4 [RS]: Sl 1 , k to end. Row 5 [WS]: P all sts, picking up wraps and working them together with wrapped sts. K 1 row. Join to held sts of back left shoulder using three-needle bind off. CO 44[49, 54, 59, 64, 69, 74] sts. K 1 row. Buttonhole Row [RS]: K2, yo, k2tog, k to end. Row 1 [WS]: P2, W&T. Row 2 [RS]: Sl 1, k1. Row 3 [WS]: P to wrapped st, pick up wrap and p it together with wrapped st, p2, W&T. Row 4 [RS]: Sl 1, k to end. Repeat Rows 3-4 until 2[4, 3, 2, 4, 3, 2] sts remain unworked after last wrapped st. When working next row, pick up remaining wrap and work it together with wrapped st.
Next Row [WS]: P to last 3 sts, k3. These 2 rows set pattern: right front is worked in stockinette st, with 3 sts at front edge worked in garter st as set. Continue in pattern until work measures same as back to underarm when measured along side edge (left edge when RS of piece is facing), ending with a RS row. Next Row [WS]: BO 7[7, 8, 9, 10, 11, 12] sts, work in pattern to end. 37[42, 46, 50, 54, 58, 62] sts. Decrease Row [RS]: K to last 4 sts, k2tog, k2. 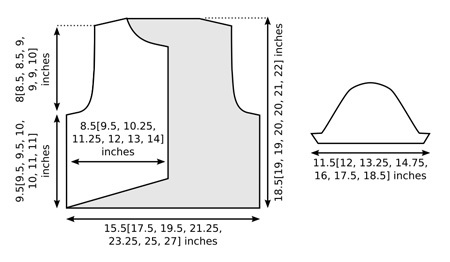 Contine in pattern until work measures 6.5[7, 7, 7, 7, 7, 7.5] inches from beginning of armhole shaping, ending with a RS row. Row 1 [WS]: P18[21, 23, 24, 27, 29, 31]. Place last 13[15, 15, 16, 16, 17, 17] sts of row on st holder. Row 2 [RS]: K1, k2tog, k to end. Repeat Rows 2-3 4[5, 6, 5, 6, 6, 6] times more. 13[15, 16, 18, 20, 22, 24] sts. Continue in stockinette st until work measures 8[8.5, 8.5, 9, 9, 9, 10] inches from beginning of armhole shaping, ending with a WS row. Row 1 [RS]: K8[10, 10, 12, 13, 15, 16], W&T. Row 2 [WS]: Sl 1 , p to end. Row 3 [RS]: K3[5, 4, 6, 7, 9, 10], W&T. Row 4 [WS]: Sl 1 , p to end. Row 5 [RS]: K all sts, picking up wraps and working them together with wrapped sts. 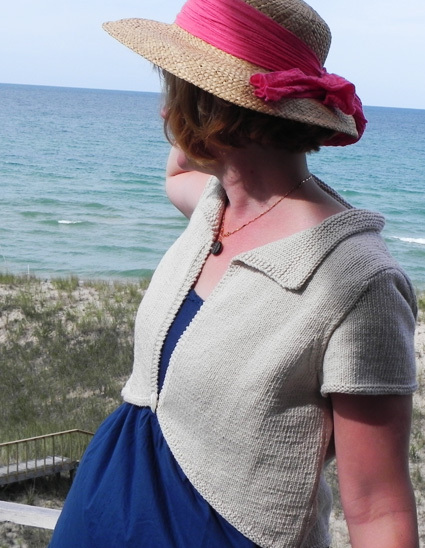 Join to held sts of back right shoulder using three-needle bind off. CO 60[64, 70, 78, 84, 92, 98] sts. K 3 rows. Increase Row [RS]: K2, m1, k to last 2 sts, m1, k2. Repeat these 2 rows three times more. 68[72, 78, 86, 92, 100, 106] sts. BO 7[7, 8, 9, 10, 11, 12] sts at beginning of next 2 rows. 54[58, 62, 68, 72, 78, 82] sts. Repeat these 2 rows 10[12, 9, 9, 7, 7, 13] times more. 32[32, 42, 48, 56, 62, 54] sts. Next Row [WS]: P1, ssp, p to last 3 sts, p2tog, p1. Repeat these 2 rows 0[0, 2, 3, 5, 6, 2] times more. 28[28, 30, 32, 32, 34, 42] sts. BO 3 sts at beginning of next 4 rows. BO remaining 16[16, 18, 20, 20, 22, 24] sts. Weave in ends. Sew side seams and sleeve seams. Sew sleeves into armholes. Place held right and left front neckline sts on needle. With RS facing, join yarn at right front edge. K right front neckline sts, pick up and k 1 st in each row along shaped neckline edge to right shoulder seam, place marker, pick up and k 30[36, 38, 38, 40, 40, 42] sts (1 st in each bound off st) across back neck, place marker, pick up and k 1 st in each row along shaped left front neckline edge, k held left front neckline sts. Row 1 [WS]: K to first marker, k27[32, 33, 33, 34, 34, 35], W&T. Row 2 [RS]: K24[28, 28, 28, 28, 28, 28], W&T. Row 3 [WS]: K20[24, 24, 24, 24, 24, 24], W&T. Row 4 [RS]: K16[20, 20, 20, 20, 20, 20], W&T. Row 5 [WS]: K12[16, 16, 16, 16, 16, 16], W&T. Row 6 [RS]: K8[12, 12, 12, 12, 12, 12], W&T. Rows 7-8: K to end, picking up wraps and knitting them together with wrapped sts. Continue in garter st until collar measures 1.5 inches, measured along front edge. Weave in remaining ends. Sew button to left front edge opposite buttonhole. Heather Hoefle is a wife, and mother of two very active boys. She lives in the Chicago Suburbs, where she works full time as a school band director, and moonlights as a fledgling knitwear designer.